We introduced our unique cubed truffles eight years ago in 2011. In September of 2018, GODIVA announced the introduction of what they deemed a new innovative concept: a Cube Truffle. GODIVA has appropriated our novel concept of a cubed truffle. 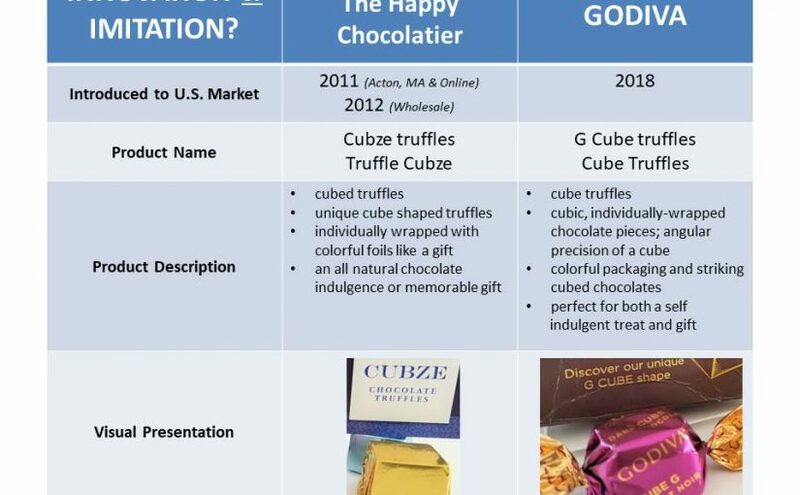 GODIVA has even used a name that very closely resembles our trademarked Cubze name. Using its substantial marketing and financial resources, GODIVA can easily overwhelm The Happy Chocolatier original cubed truffle, Cubze. If our truffle Cubze fans and supporters wish to spread the word about GODIVA’s actions, we would welcome it! We don’t want truffle Cubze to be overwhelmed by an imitation; even if the imitation is by a self-described “global leader in premium, artisanal chocolate” that is “committed to innovative” products. Help us Defend Our Cubze. If you are so inclined, email GODIVA: letters@godiva.com.